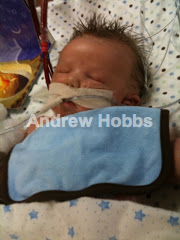 Here is a picture of Andrew before his move to the PICU. Yes, Andrew is going to be placed on ECMO shortly. They were able to get his CO2 down some but his pulmonary hypertension needs attention. They have also found a Coarctation of the aorta which will be treated after he comes off ECMO. His head Ultrasound appears normal. I pray for your baby, and congrat's on a beautiful little boy!!! We are praying! Let us know if we can do anything. I'm so sorry to hear this. You all remain in our constant thoughts and prayers. Please don't hesitate to call if you have any questions or need to talk. Remember, they would not put him on ECMO if they didn't think he could come off. ECMO will give him the rest he needs to get strong enough for surgery. Many prayers for a quick stay on ECMO and a realtively easy recovery! My baby is an ECMO/CDH survivor who is now thriving and doing great at home and I know that ECMO can help so much in those first days-letting the babies rest and get accustomed to using their organs. Praying and praying for Andrew and for both of you. Keep positive thoughts going and remember to take care of yourselves. This will be one hard fight...get ready here comes Mr. "I want things MY way!" 9lbs 4 oz(:) How wonderful! Welcome to the world Andrew. You have just arrived and so many people love you and are praying for you! Baby Andrew is in our thoughts and prayers. (((hugs))) Our CDH miracle had a coarctation of the aorta too. It was repaired at 6 weeks old. If you have any questions I'm here for you. Welcome to the world Mr. Handsome and best wishes during your biggest fight of your life! Much love and prayers coming your way and to your Mommy and Daddy, too! Thinking of you constantly! He is such a handsome little boy! ECMO saved M's life, so you have to remember that it can be a wonderful thing...scary, what you don't really want, but necessary sometimes. Keep thinking positive! You are such a strong family! SUPER, STRONG PRAYERS coming from SEATTLE!! He's so big and looks so strong. I'm sure he'll pull through all of this just fine. Prayers to all of you. I'm so thankful you guys have such a great support from people who have been down this road. It sounds like these CDH babies are tough cookies! Keep hanging in there! Love you guys and still praying! Welcome to the world baby Andrew. My thoughts are with you and your mommy and daddy. Wishing you all the best. Many prayers are with you and your family in the days to come. 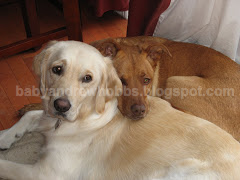 This blog is wonderful for the family as you will need all the loving support possible. but significant things you can do for this precious little guy!! Love and embracing thoughts for all of you! Congratulations, Gene & Becky & welcome baby Andrew! Hoping the ECMO won't be for too long. So glad to hear the brain u/s is normal. Oh my goodness he is a big, strong little man! He is going to pull through this like a champ! Give Becky a big hug for me and know that my thoughts and prayers are with y'all. Many prayers for Andrew!! Fight Andrew fight! ECMO is going to give his lungs and heart time to rest and strength everyday to get him to his surgery. Stay strong and continue to believe in miracles. Congratulations on the birth of handsome baby Andrew! My thoughts and prayers are with you as you begin your CDH rollercoaster ride-buckle up and hold on :) !!! Thinking of you and praying for Andrew. Psalm 18:2 The Lord is my rock, my fortress and my deliverer: my God is my rock, in whom I take refuge. He is my shield and the horn of my salvation, my stronghold. Love to you. The prayers are flowing your way. What a wonderful support group you have. Sending hugs and kisses to Andrew from his Grand Auntie Paula. When my brother was born he suffered Meconium Aspiration Syndrome (MAS). 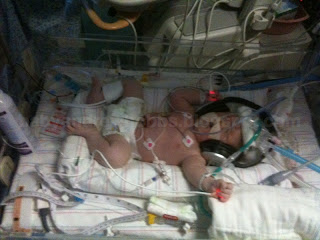 He was placed in the NICU at Duke and put on ECMO. He recovered, and was sent home after about a month in the hospital. He is 10 years old now, and healthy as can be. Your precious baby is in good hands. I will be praying for him and your family! What a beautiful (big) boy! Our thoughts are with you all as you begin the next stage of your journey together. He is in good hands. We love you baby Andrew! Know that your Aunt Susie and Uncle Bryan are praying that you'll be strong. If we can do anything, please let us know. We wish we could be there with you through this, but know that our hearts are there with you instead. It's so encouraging to hear some of the other CDH stories. I'm glad they are sharing their experiences with you to give you hope! Thinking of all three of you and hoping that Andrew has a good night. Thinking and praying for you all on your CDH journey! Fight baby Andrew, and show CDH who's boss!! Congrats on the birth of your beautiful son! I am sorry to hear that he needs to be placed on ECMO but Andrew is a strong boy that will fight to conquer this hurdle. My prayers are with all of you through this hard time. Welcome to the world BIG guy! :-) WoW Becky...you are a trooper! You all are in our prayers and will continue to be each day. We're looking forward to seeing your sweet baby boy THRIVE!! So happy for you!! 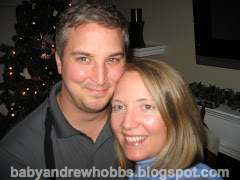 Congratulations Mommy and Daddy Hobbs! Congratulations to everyone! He sure does have a head of hair, Becky must have had heartburn the entire pregnancy, at least that's what they say. Dazed and Confused... Wait, what day is it? The Good, The Bad And The Truly Frustrating!